Whether you’re looking for a golfing gap year or formal qualifications, our courses will set you on the path to a successful career in the golfing world. Through intensive golf tuition, regular competitions at the highest Junior level plus educational studies, you will develop your vocational ambition together with a real understanding of what a golfer’s life is like on the international circuit. We have been coaching golfers between the ages of 16 to 19 for over 10 years now, making us very experienced in not only how to deliver great coaching to this age group, but also how to look after them off the course as well. – BTEC National Diploma in Sport Level 3 (Performance & Excellence) the equivalent to 2 or 3 A Levels – ideal if you plan to continue your education in to University. – A-Level courses that have been specifically adapted to fit into our 23-week year in the UK, and our 9-week trip abroad. Each term is structured around a rotation of coaching, education, game development, gym, practice and competitions. This unique structure allows students to participate in each activity every day, allowing constant monitoring of their education and golf performance. Many students use The Golf College as the foundation route to US Collegiate Golf. To help improve your chances of securing a US scholarship, at the end of your first summer term with us, you will have the option of going to Florida for 10 days to showcase what you have learned to US colleges. 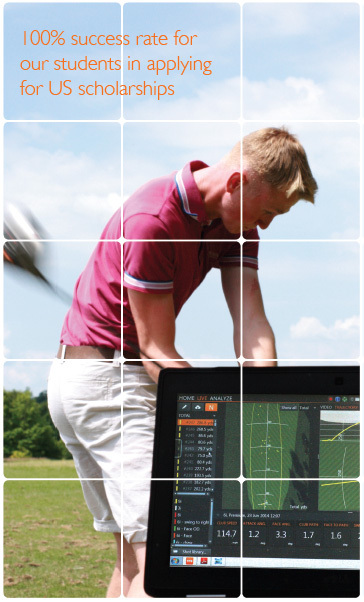 Autumn and summer terms: You will be at The Golf College, Lindfield Golf Club, England. Winter term: You will go abroad, continuing your education, playing tournament golf and working on your game to get ready for the golf season in Europe. – Social events arranged by us (usually 2 per term). Extras include travel to England, college kit, other studies, host-family accommodation and the Summer Florida Showcase for US Scholarships.